Sarfaraz does admit to have been slightly overawed by big stage, especially when he came up against Pakistan. 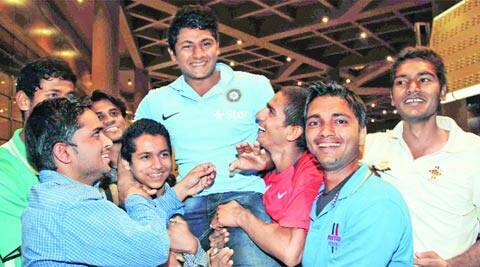 For two weeks, Sarfaraz Khan enjoyed a rare and unique fling with the spotlight. Being the cynosure on a cricket field might not have been that new an experience for him, considering his gargantuan achievements in school cricket. But this was his first time grabbing eyeballs on television. And during the course of the U-19 World Cup it was the 16-year-old who proved to be India’s go-to man, whether it was while orchestrating eye-catching cameos with the bat or snaring acrobatic catches in the outfield. The Indian colts, who went into the tournament as defending champions, made an early exit but not before Sarfaraz had lit up the tournament with his hard-hitting exploits. For now, life has returned to normal. The Indian jersey is now tucked away safely in the cupboard at his home in Kurla. Sarfaraz is back in his grime-ridden whites, grime accumulated from the maidaans of Mumbai. Back under the stringent vigil of his father, Naushad, at his club’s nets at Azad Maidan. The loss to England in the World Cup quarterfinals though still rankles. And he only echoes the sentiments of the entire Indian team when he admits that the team too never expected to be shown the door so prematurely. “We went there on the back of four series wins and it took one day to spoil a whole year’s hard-work. After the defeat against England, I just went in and broke down. My team-mates asked me to accompany them for post-match presentation but I just couldn’t. I kept crying for a long time,” says Sarfaraz. What hurt more was that the Indian bowlers had failed to defend a decent total, one that had been set up by the youngster’s death-over heroics, as he smashed an unbeaten 52. That knock was in many ways symptomatic of his contributions throughout the World Cup. In the pressure game against Pakistan, Sarfaraz had walked in with his team in trouble and following a nervy beginning produced a match-winning 74. He then had shown nerves of steel in guiding his team in a tricky run-chase against Scotland, scoring an unbeaten 45, having walked in at 22 for 5. “I was under pressure before going to the World Cup. I had just one hundred but that too had come in a crunch situation in Vizag. I wasn’t carrying the same form as the others were,” he adds. He does admit to have been slightly overawed by the big stage, especially when he came up against Pakistan. For the first 15 balls, he was all at sea. “I told myself enough is enough after that start. There was no point getting dismissed while simply trying to block the ball. My opponents thought that I wasn’t good at the sweep-shot but I showed them that it was instead my favourite shot,” adds Sarfaraz. His sweep shot was a result of the many matches he had played on the many grounds around Mumbai that have short square boundaries. Father Naushad had taught him the techniques of preparing a wicket. “Once you know how to make a pitch, you start reading it better. The ones in Dubai were on the slower side. On those kind of wickets, you have to be dead sure about moving forward or back as a batsman. But I had done my homework,” the youngster explains. Unlike some of his U-19 teammates, Sarfaraz will not now get to showcase his impressive skills on the IPL stage. He’ll have to wait another 12 months to do that as he was yet to play a first-class match for his state team. But he could soon be on the brink, considering immediately after his return from Dubai, Sarfaraz was called up to the Mumbai side for the Vijay Hazare Trophy.